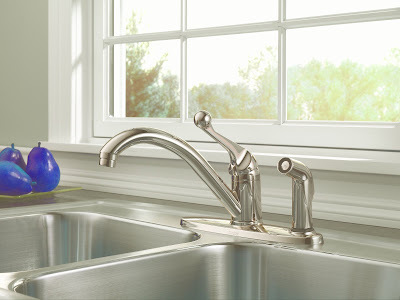 In the 1950s, the Delta Faucet Company introduced the first single-handle kitchen faucet. 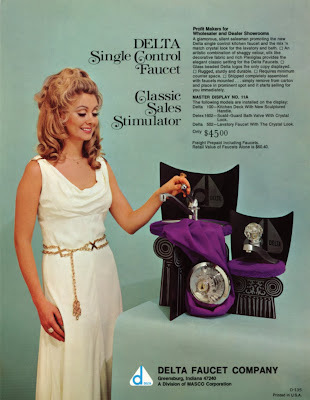 Back then, it was called simply The Delta Faucet. For a long time, this is what a kitchen faucet looked like. Times changed and tastes changed and Delta introduced a wide collection of other styles. 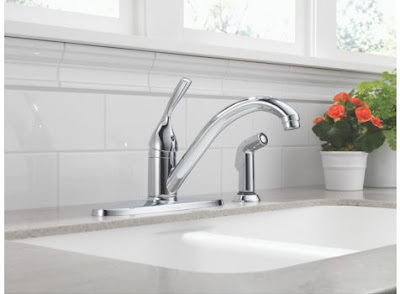 They remained true to their roots and the original, single-handle Delta faucet never went out of production. I grew up in a rambling old house in rural Pennsylvania. The kitchen in that house had been updated at some point in the 1950s and when I arrived in the 1960s, that same kitchen was still feeding our family and serving as our central gathering spot. I'm fortunate to have a lot of photos from those years and when I look back through those old black and whites a lot of them were taken in that old kitchen. 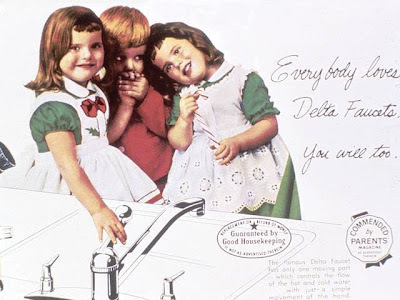 From the background of some of those photos, I can see that we had a Delta single-handle faucet. We were hardly unique in our faucet choice. The Delta single-handle delivered tap water to a generation. Well, rather than retiring the Delta single-handle, it's now called The Classic and Delta just announced The Classic's first redesign in its more than 50-year history. Here's what The Classic looked like in the last model year. That kitchen faucet has been in more apartments where I've lived over the years than I can count. And why not? It worked, it lasted a long time and it was an inexpensive faucet. Here's what it looks like now. Wow. 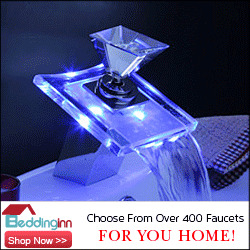 The suggested retail price on that faucet is $133.50 but I found it for less than $90 on a number of plumbing websites. Double wow. 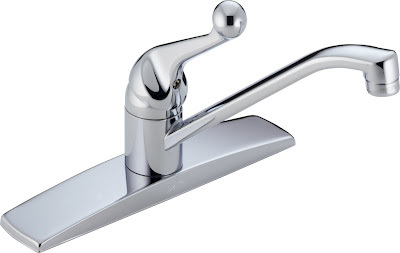 You know, if you showed me that faucet and told me that it cost $400, I'd probably say something like, "Hey, that has really nice lines..." I'm telling you, that price point is proof that low budgets don't have to mean ugly outcomes. That Classic is an attractive fixture for any price point. What makes it beyond attractive is that The Classic is a value proposition all around. Check out the entire Classic collection on Delta's website. Delta's update of The Classic isn't purely cosmetic, the lion's share of the development of this faucet is inside, where you can't see it. Delta threw out everything about how a faucet is supposed to work and re-imagined it from the ground up. The original single-handle had a then-revolutionary ball valve inside of it. It was an industry first that became an industry standard. Well, Delta's making industry history again with the development of their Diamond™ Seal Technology. The Diamond™ Seal valve is leak proof, lead-free and will last ten times longer than the valve it's replacing. 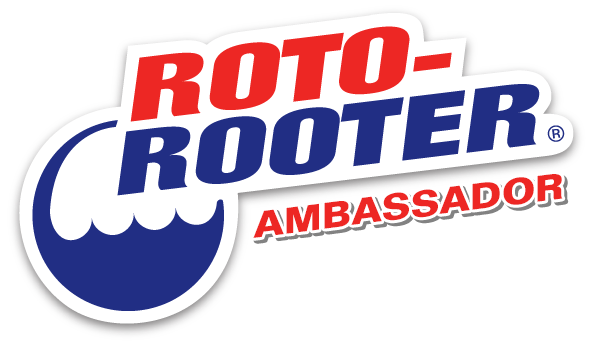 Here's a video that explains Diamond™ Seal Technology. 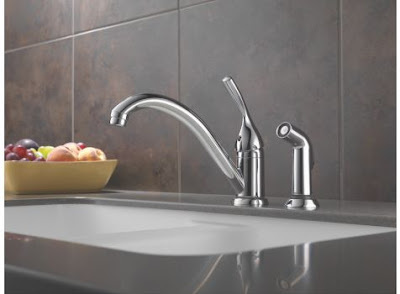 All in all it's a real winner and it's emblematic of the incredible things Delta Faucet has been up to in the last few years. Seriously, spend a little time on their website and see what Delta can do. Oh and fans of mid-century nostalgia will be happy to know that the ball handle is still available. Great new faucet. I had that old faucet at the cottage in the 70's. Ho, ho, ho. I think everybody did. It's good to see it be redesigned rather than retired. Delta's technology is cutting edge and their new designs are fantastic. I wouldn't think twice about specifying one for a kitchen design... in fact it'd be my first choice for my own kitchen. I like the Leland Series "teapot" design 'cuz I like stuff that looks old but doesn't act like it (sorta like me!). "This dramatic kitchen pull-down is a perfect combination of traditional style and modern functionality, including Delta's exclusive MagnaTite™ docking to keep the wand securely in place." Yes, I do like the new Delta and would specify it in a heart beat. That was not always the case. You sound like me Pam! I'm telling you, had you told me two years ago that I'd be taking Delta seriously I would have thought you were crazy. But they are onto something big and it's across the board. The innovations they've rolled out in the last year alone are individual game changers. Combined; Touch2O, MagnaTite and Diamond Seal have made them my new go-to brand for faucets. I have specified more Pilars in the last three months than any other faucet. I'm a definite believer. How many CFMs do you need for your cubic feet? Reader question: How do I display small objects? New media musings; quo vadis?